Yosh and Aki were the most accommodating, incredible hosts. I truly miss them and this cozy home . Thank you. Book 4 nights, stayed another 4. Beautiful intimate guest house that makes you feel like you're truly living at a local home. Would recommend if you're looking to learn about local life in Osaka and have a relaxing and quite time. Yoshi and Aki the couple that runs it are amazing, I don't think I ever saw them without a smile on their face. Beds are super comfortable, big, and quite. The place is spotless, honestly. Hosts are great, really nice atmosphere, good location near subway, Osaka castle 15min walk. Really recommended to get the guesthouse experience. This place is AMAZING! If you’re looking for the guesthouse experience without the price tag, this is the spot for you. The beds are private and comfy, and the hosts are lovely and welcoming. Not a ton to do in the immediate area but grocery store and train stop both nearby and one stop from Osaka castle. Definitely not a place to stay if you’re looking to party, but great for a quiet stay. We had a great stay at the guest house! Took us a little bit to find but once we did Yoshi was very welcoming and had all of the facilities we needed. He gave us lots of advice on where to go. Recommend! I traveled with my partner several places in Japan. This was probably our favorite place that we stayed. Yosh is so nice. He really makes you feel at home. He also makes great Takoyaki which is a specialty in Osaka. We had a great stay ,and it was easy to strike up a conversation with other guests. The guesthouse is so cozy, and the beds are lovely and spacious. I’d definitely recommend it as a place to stay if you’re looking for a quieter and more homey experience. I’d happily stay here again. Yoshi-San and Aki-san were incredibly friendly and helpful. Never did I feel uncomfortable in any way and the traditional feel of the guesthouse itself is charming. Every morning was greeted with a smile and coffee. I also had the opportunity to try on Aki-san's antique kimono which was a pleasure to experience. I can only thank them for such a pleasant stay. Great stay, very friendly host and the best bunk beds i have ever seen. Has a very traditional and quiet feeling to it and you have a lot of privacy. 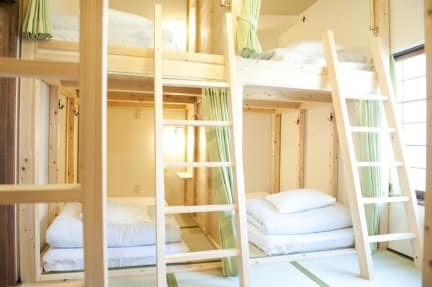 Location is slightly inconvenient if youre spending most of your time around dotonbori, namba and umeda. The staff is very professional. They helped us a lot to find the places that we wanted to visit. It's beautiful and easy to find it. I really liked to stay in such a traditional place. It is a very nice experience. The hostel is located in a more local area and it takes more time to get to the center, but it is quiet. The owners are the sweetest! They have a lot of great information for you and even went outside with me when I left to wave me goodbye until i was gone!